Sulfonamide (SA) drugs are among the antimicrobial agents utilized for preventing and treating animal infections. Unfounded use of SA drugs may contribute to such problems as chemical residues in food and the environment. As a sensitive, selective and rapid method, the immunoassay has been investigated with varying parameters by numerous research groups for monitoring and determining sulfonamide residues. To understand the development of the immunoassay for sulfonamides, a thorough summary of the methods for detecting sulfonamide residues present in food, feed, and environmental or biological samples is presented. Since the approach to the immunoassay development has involved the design and synthesis of haptens for sulfonamides, the discussion focuses on the design of haptens and their effects on the antibody features, as well as on immunoassay specificity and sensitivity. Keywords: Sulfonamides, immunoassay, hapten design, antibody preparation, antimicrobial agents, synthesis of haptens. Keywords:Sulfonamides, immunoassay, hapten design, antibody preparation, antimicrobial agents, synthesis of haptens. Abstract:Sulfonamide (SA) drugs are among the antimicrobial agents utilized for preventing and treating animal infections. Unfounded use of SA drugs may contribute to such problems as chemical residues in food and the environment. As a sensitive, selective and rapid method, the immunoassay has been investigated with varying parameters by numerous research groups for monitoring and determining sulfonamide residues. 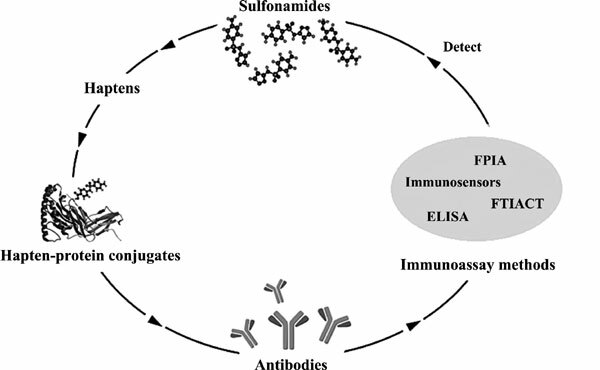 To understand the development of the immunoassay for sulfonamides, a thorough summary of the methods for detecting sulfonamide residues present in food, feed, and environmental or biological samples is presented. Since the approach to the immunoassay development has involved the design and synthesis of haptens for sulfonamides, the discussion focuses on the design of haptens and their effects on the antibody features, as well as on immunoassay specificity and sensitivity.